Enjoy a beautiful time on the water while you nibble on cheese and sip delicious wine on this 1.5-hour sail. As you sail through beautiful Baltimore Harbor, take in the gorgeous scenery of the skyline as the city lights up. Treat yourself and a loved one on this elegant sailing experience. It's BYOB, so bring your favorite bottle of wine and we'll take care of everything else! With your favorite wine in one hand and your loved one's hand in the other, arrive at Inner Harbor Marina, located at 400 Key Highway. Here, meet your professional captain and crew for your intimate voyage. Find the spot on the boat with the best vantage point and settle in for your 1.5-hour sailing experience. Everything you need to enjoy your wine is provided: corkscrews and wine glasses are on board for you. Between sips, try several gourmet cheeses from around the world. Watch as the skyline lights up and shimmers on the water. Relax and and enjoy a romantic evening with your favorite person. 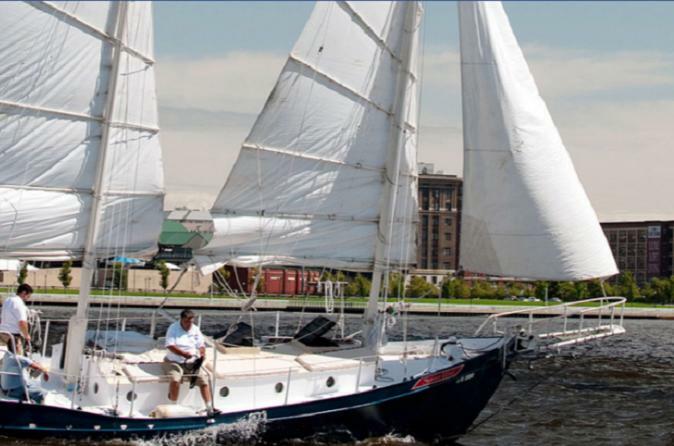 Delight in an intimate evening on the water with this 1.5-hour sailing experience. Please arrive 15 minutes prior to departure time for boarding. A crewmember will meet you at the marina. The boat does leave on time.